In the late 1990s, an out-of-use railroad trestle, nestled between buildings on Manhattan's Lower West Side, sat decaying. 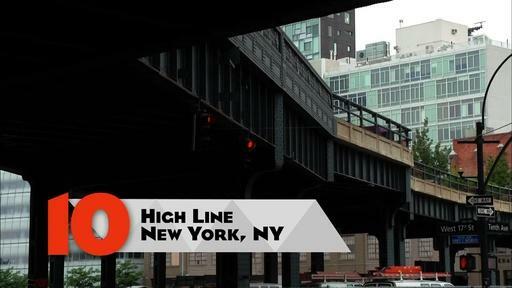 The elevated tracks of the defunct High Line were home to weeds and illicit activities. Building owners and most residents wanted it torn down. But Joshua David and Robert Hammond, two neighborhood residents, felt there could be a better way. They founded Friends of the High Line and advocated the preservation and reuse of the trestle as public open space. The idea gained traction thanks in part to the photos of Joel Sternfeld, which showed the unique character of the High Line. More residents, including some celebrities, lent their support. Perhaps the most important shift came when a Friends of the High Line-commissioned study showed how saving the High Line could revitalize the area and attract visitors and tax revenues. A design competition was held, and by 2006, support, initial plans, and funding were in place. Friends of the High Line and the City of New York (now working in partnership) selected a multidisciplinary design team to create a park that would embrace the buildings and city vistas around it and its own less-than-romantic past-the antithesis of Central Park with its ponds and artificially created sheep's meadow. A design team led by James Corner, drawn by the High Line’s postindustrial railroad character, wanted to create a secret, magic garden for visitors to discover when they ascended the stairs from the street. Piet Oudolf, responsible for the new High Line’s plantings, incorporated grasses and wildflowers that had adapted to the trestle’s conditions into his plans. Architects Diller Scofidio & Renfro added what they described as “part architecture and part agriculture.” They defined a series of discrete planting areas, gathering spaces, and walkways along the trestle’s path. Individually laid concrete planks allow plants to grow up through the gaps, echoing the wild character of the trestle during its period of postindustrial ruin. 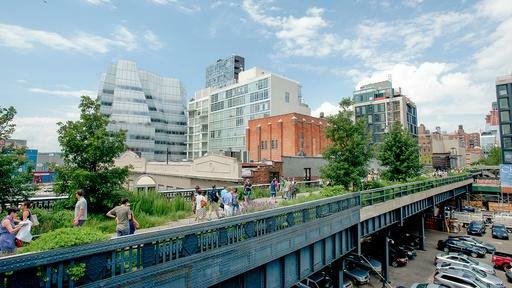 In 2008, Friends of the High Line accomplished what had seemed very unlikely a decade before. The first segment of the new High Line Park opened to the public and received a most exuberant reception. Today, nearly five million visitors a year visit the High Line. Browse the Friends of the High Line site. Explore activities you can do on the High Line. View a project summary and more photos of the High Line. Plan a visit to the High Line. The High Line embraces the buildings and city vistas around it and celebrates its post-industrial character.